Thoughts, opinions, ideas and memories. This Daily Prompt post struck a chord with me because since I started “My Other Blog” I have used it quite often to rant about things that annoy me. I am not really a cranky person but I do enjoy the opportunity to publicly vent. I’m thankful for many things though. I’m thankful that I live in Australia. For all the things that we complain about we are far luckier than people in many other countries. We have the right to vote for the government of our choice and nobody will try to kill us for it. Our cities, while they have their poor districts, are not deserted wastelands or riddled with gun toting gangs. If we can’t find work we get some support from the government to help us. For myself I’m grateful that we own a home of our own and have no mortgage and that we have enough money to eat, pay bills and still enjoy some of life’s little pleasures. I’m thankful that I live in a state with beautiful scenery, a wonderful climate and friendly people. I’m thankful that I’ve had the opportunity to travel and see some of the places that I always wanted to see. In fact I feel like I have had a pretty good life, some sadness and hard times of course, we all have that but I’ve not experienced the tragedies that some people do and for that I’m the most thankful of all. I’m not just being a sore loser. I really believe that Rupert Murdoch through his media outlets probably influenced the outcome of the election. Newspapers are meant to report the facts. Opinion pieces are fine but not on page one in glaring capitals. Why have we all been made to feel that Australia was on the brink of economic disaster? 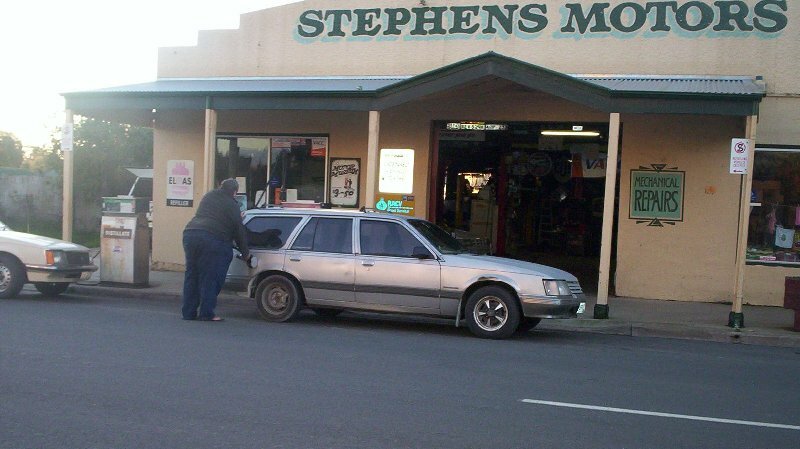 Yes there are a lot of things in the country that need fixing but when isn’t there? Can anybody remember a time when we weren’t asking for better schools, hospitals, roads etc? I can’t and I’m not young. Regardless of which political party you choose to support everyone deserves to get the information they need to make an informed decision. This election has been more like one of those terrible reality TV shows. It’s all been about personalities. I have included a link to the online petition Complaint Against News Corp. Please read it. I won’t say sign it because that’s up to you but reading it can’t hurt can it? That’s my Rant for today. I could say a lot more but I’m too cross right now. Today we went to the Hobart Model Railway Show. I didn’t get to the 2012 show but normally I go every year. I have always loved trains, in fact some of my earliest memories involve them. 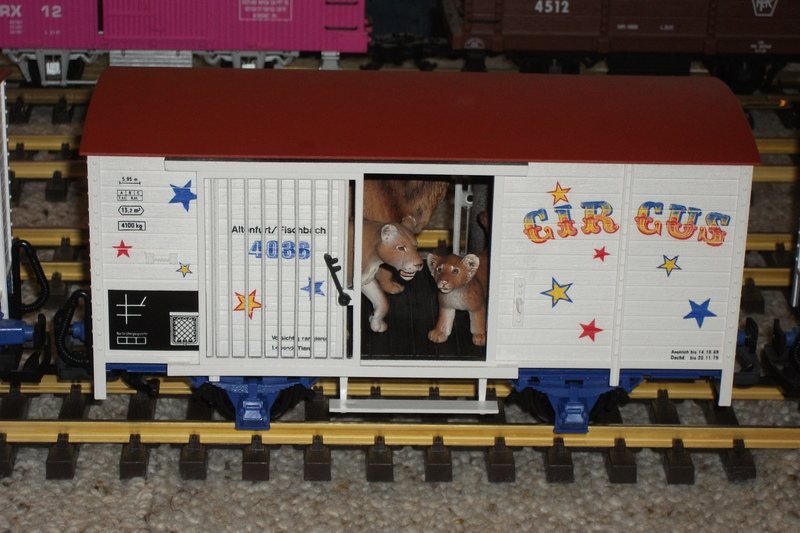 I was lucky too that my parents gave me a train set when I was a child. I loved it. I can still see that big red Triang Hornby box with a picture of a wonderful model railway on the front. It had a locomotive called “Princess Victoria and three maroon and yellow carriages. I loved all the little bits that went with it. The signals, the station with the tiny station staff and passengers, the extra bits of track that came in an X or Y shape fascinated me. For a while we lived in a council house that had a small room with a raised wooden platform, maybe it was meant to put a mattress on, anyway it became our playroom and there we set up the train set, our toy farms, zoo and dollshouses. It wasn’t all to scale but my sister and I would spend hours playing with it all. One summer when we were in Clacton On Sea for our summer holidays mum took us to a model railway and dollshouse exhibition at the town hall. I don’t remember a lot about it now but I do remember how much I liked it and I still love visiting model railways and dollshouse exhibitions to this day. I have a particular affection for British layouts and especially for Hornby trains because of those early experiences but I have seen model layouts based on real and imaginary places in other countries that I’ve been very impressed with. 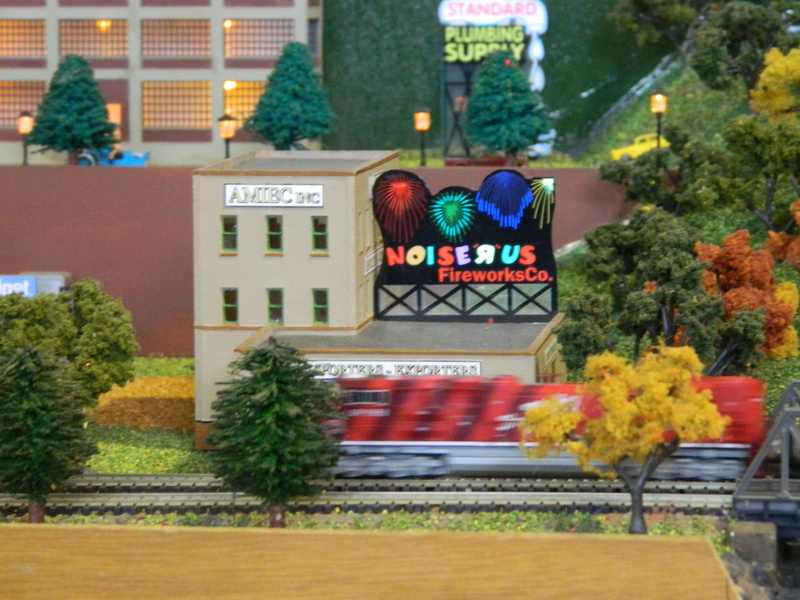 Hornby Trains, some of the buildings are tins. 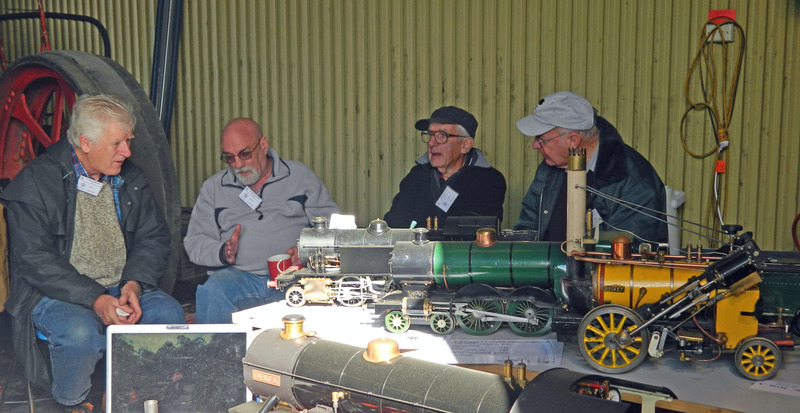 One publicly exhibited model railways that I remember well was at the Royal Adelaide Show every year for many years. It was called “Mini City” and was a European layout. You had to pay to go in but could stay as long as you liked. It was a big layout with a big city station, countryside with farms, a church with a wedding, an airport, a cable car and more. They would dim the lights to simulate night and even after a few years of seeing it I still enjoyed the spectacle. An American style layout. I liked this signage. Probably the best model railways I have ever visited was right here in Hobart. It was called Alpenrail and operated in Claremont for many years. It was based on Switzerland and was so accurate that the operator, Rudi, told us that he had visitors from there who recognised places near their home in the model. It was a big layout and there was a lot to see in it. In fact it was just now as I was researching links for this post that I discovered that it was now closed. I have included a link to the history site on their webpage although I don’t know how much longer it will be there. There used to be a DVD available about how the railway was built but I don’t know if you can still buy it except perhaps on the secondhand market. 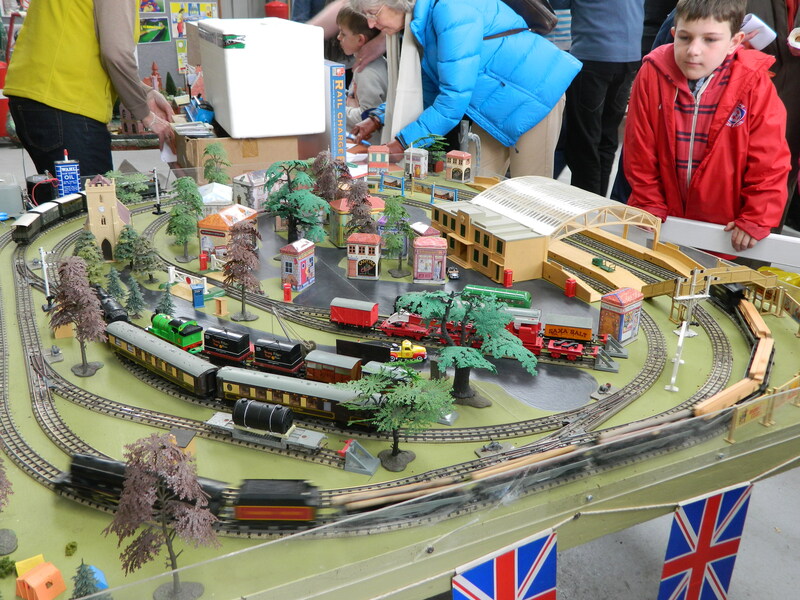 Model Railways are great fun for young and old. Children enjoy seeing a tiny world and probably just like I did they wish they were tiny themselves and could go there. Adults can enjoy the accuracy of the modelling, reliving their childhoods or just the whimsy of some layouts. There are different types of modellers, for some it is all about the scenery, others like to model a particular place and time and are particular that the trains should run to a “real” timetable. Others have a favourite gauge, Z, N, HO/OO or the large O gauge garden railways. 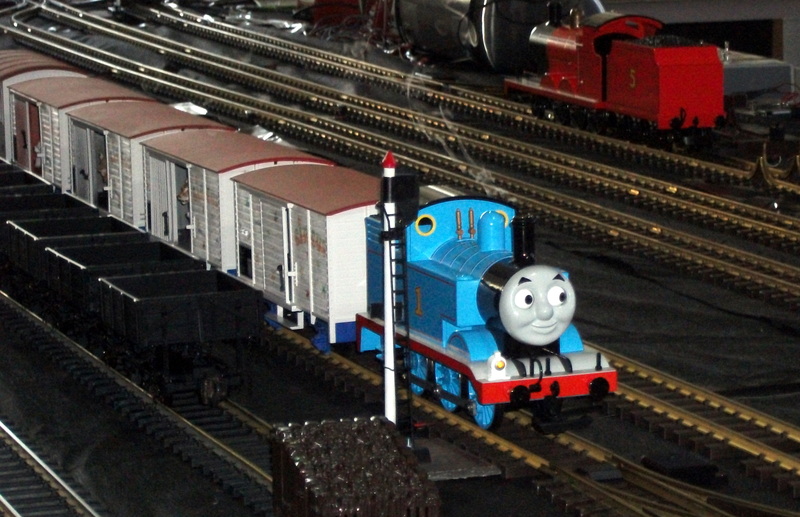 Thomas the Tank Engine is nearly always featured and there is often a Lego Railway which children enjoy. 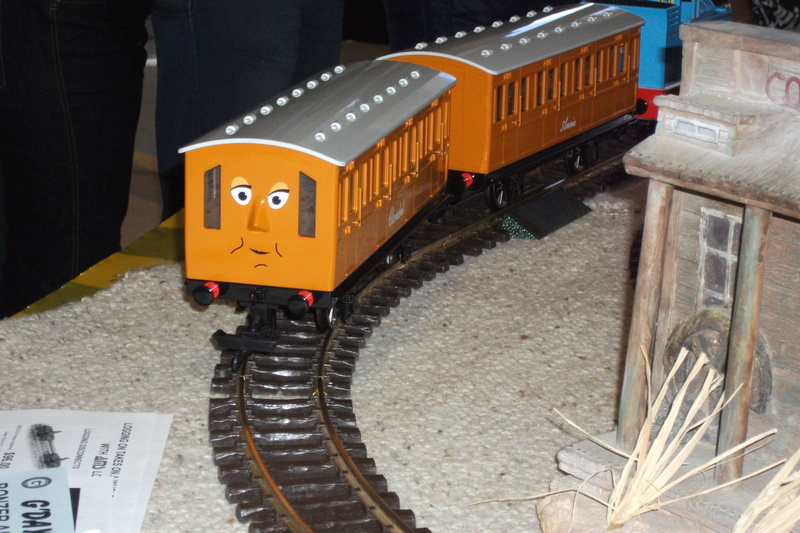 Some of my photos were taken at this year’s Model Railways Show and some from previous years. 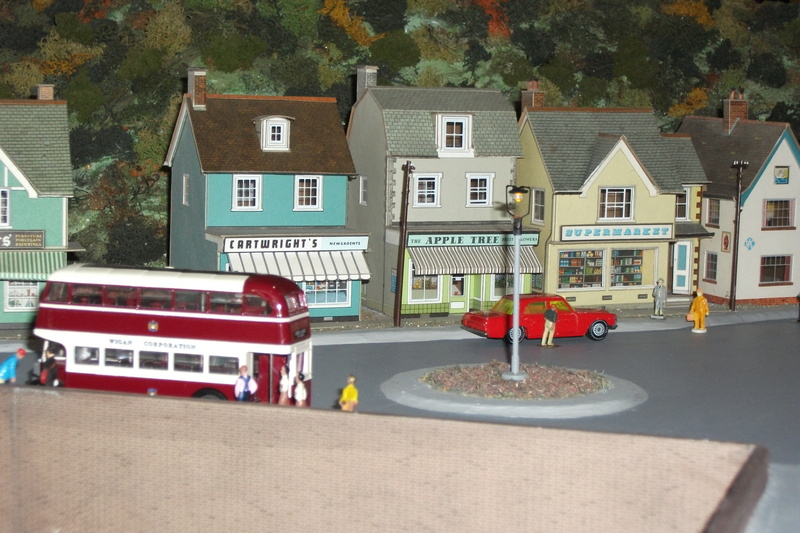 An English village with the High Street and passengers waiting for the bus. 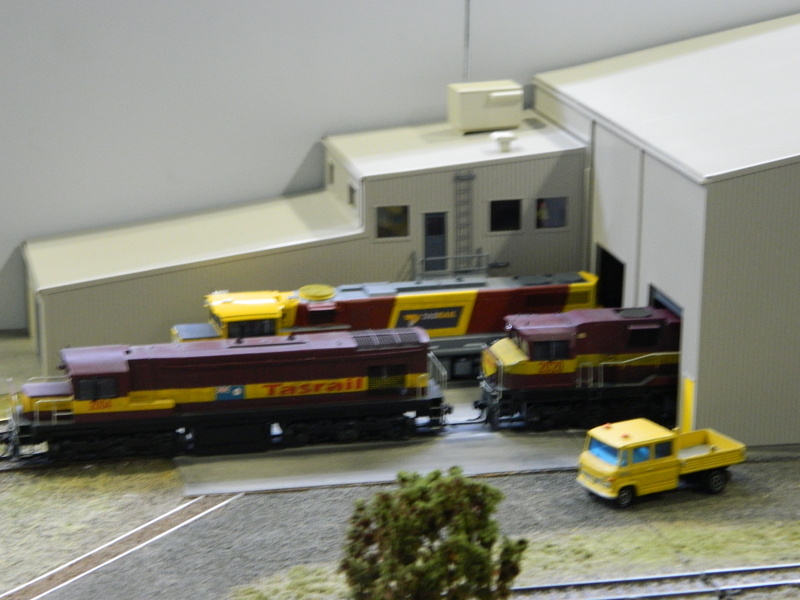 Tasrail Locomotives on the “East Tamar” layout. I have mixed feelings about Australian model layouts. This year’s theme appeared to be modelling Tasmanian railways and I saw some very good ones depicting Tasrail when it was much busier than today. I liked “Brighton Junction” and “East Tamar” especially. Seeing familiar locomotives from the SAR or AN like the ones I grew up amongst is nice but I have to admit that I don’t find the country layouts nearly as interesting to examine as the European and British style ones with their towns crammed with activities and different types of scenery. I guess I am a scenery buff. I do appreciate the modelling skills needed to make Australian scenery and buildings as they often have to be made “from scratch”. Away from the main exhibits were the larger steam engines built by enthusiasts who proudly fired them up. I was struck by how miniature railways always seem to appeal most to the very young and the not so young. “Engineers” enjoying a chat while they show off their exhibits. 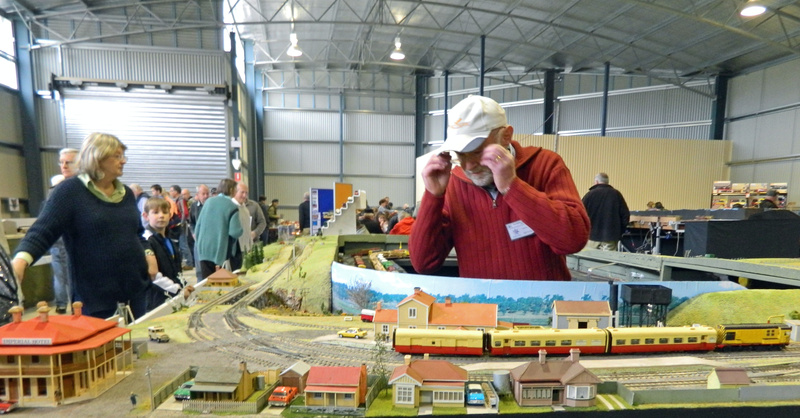 The Hobart Model Railway Show is on for two days every August. Think about paying a visit next year. These lions are about to escape! I first heard of the Myer Briggs personality types years ago when I was doing a work related course. It was one of the few things about the course that I found interesting and enjoyable. I was on the course because my supervisor said I had to be, no other reason. There we were, an assorted group of people from TransAdelaide where I was working at the time, clerical people, mechanics, management types and a handful of us cleaners feeling rather out of our depth. I had always considered myself an introvert but it was interesting to learn that there are many different types of introverts and I was quite surprised to discover that several people who I had considered quite outgoing were introverts in some situations. It also helped me to understand why I had trouble getting along with some management types who were always thinking of the “Big Picture”. Today out of curiousity I took an online test wondering if the results would be the same. They were and I think that the things I’ve done in my life bear out the accuracy of the results. After I left TransAdelaide (now Adelaide Metro) I decided I’d enjoy working in hospitality. 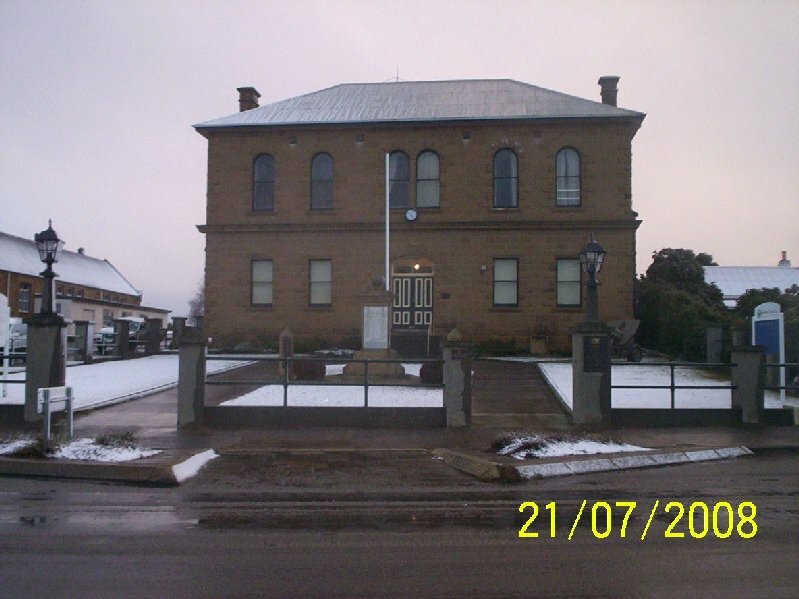 I got a job as a housekeeper in an Adelaide apartment hotel and when we moved to Tasmania in 2002 I found a similar job in Hobart. Later I became a volunteer at a community radio station and now I volunteer as an office assistant and cleaner at a church in my town. ISFJ – “Conservator“. Desires to be of service and to minister to individual needs – very loyal. 13.8% of total population. I think that I would like to live a semi nomadic life travelling often but always returning to home base. I do often daydream about travelling to places near and far. I love planning trips both real and imaginary and I love the anticpation of setting off on a journey. There are still many places I’d love to see. 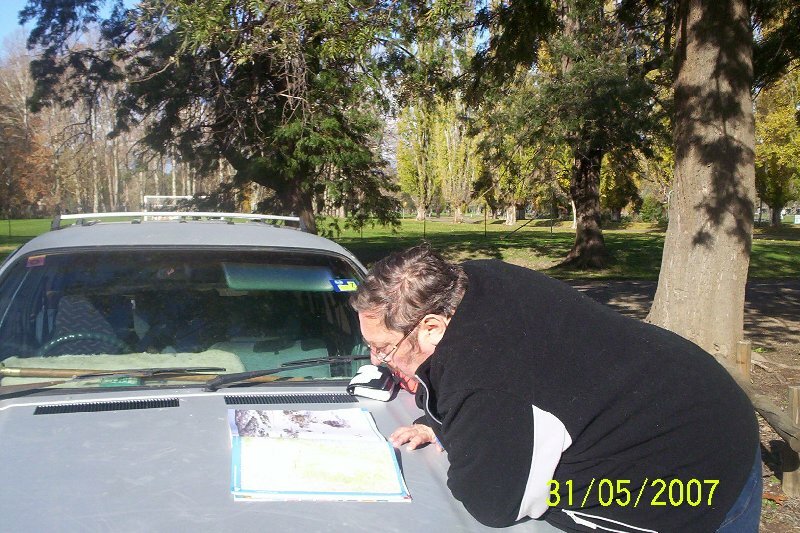 I often see “Grey Nomads” camped in a park near where I live and I think that would be a great way to travel spending as much or as little time in a place as you wish and carrying a little bit of home with you wherever you go. However I could never be a total nomad because I would miss my stuff. I’d miss having enough space to work on scrapbooking projects. I’d miss my doll collection and I’d be bound to suddenly think of some book sitting on the bookshelf at home that I wanted to read again. I’d miss curling up in a familiar armchair in a familiar room and feeling relaxed and contented. Seeing new places and revisiting old ones is wonderful but I think your mind can only take in so many new sights at a time and then you can’t absorb any more till you have digested all you have seen. Going home is a chance to reflect and recharge before setting off again. It’s been a while since I wrote anything for this blog. I have been busily blogging away in my head but that is as far as things have got as life, in the form of a broken bed and the need to renovate the bedroom before it is replaced, intervened. One of the things that I often find myself thinking about when I have time to daydream is travel. Not necessarily travel to faraway places although I do think about that a lot but just about the pleasure I get from journeys no matter how short or mundane they may be. This is particularly true if I travel alone. I often think that the best part of a journey is the beginning, the sense of anticipation you get from setting out to see something new and the departure from the daily routine. The Redline Bus Depot in Hobart doesn’t have the atmosphere of an international airport or one of the great railway stations of the world but it is the starting place for one of my most frequent journeys the 80 kilometre trip to Oatlands that I make every month or so. I usually catch the Launceston bus that goes at 5:30pm. At this time of year by the time I arrive at the Depot it is nearly dark. There is not much to the place, a large room with a row of seats for waiting passengers, a vending machine and a television with the sound turned down. In summer I can watch the cricket while I wait for my bus but in winter it’s generally more interesting to read a copy of “Tasmanian Travelways” from the pile on the table or as most passengers do play with their phones or iPads. The usual passengers on a Friday evening are a mixed bunch. 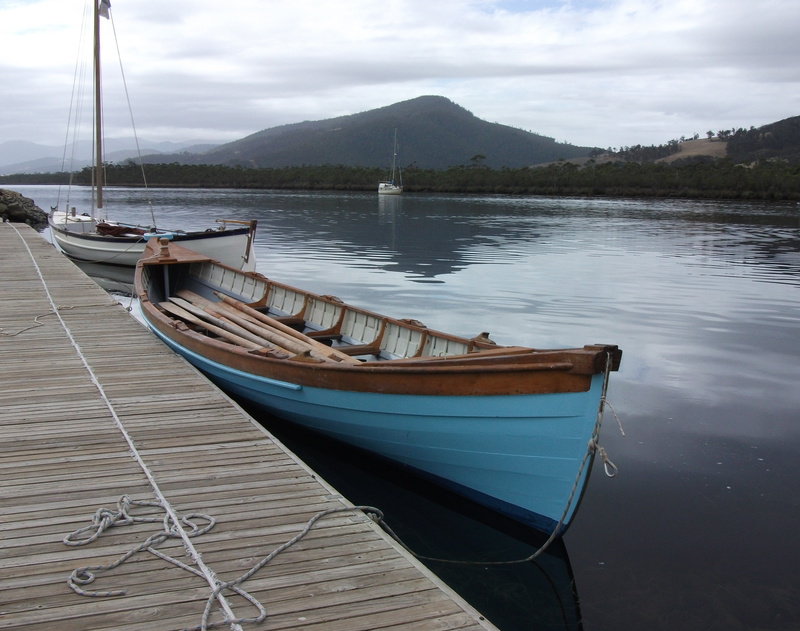 There are unaccompanied children being sent to spend the weekend with their fathers, teens going to sports events in Launceston, university students going home for the weekend, mothers with small children and older people from the country going home after a day of shopping and doctor’s appointments in Hobart. Around 5:15pm the driver starts loading luggage onto the bus. It’s usually the same driver and I say hello to him when he picks up my bag. Once most of the luggage is loaded we are allowed to board. I like to sit near the front of the bus as my stop is only a bit over an hour away and I always take a window seat if I can get it. Usually the bus is full and I have a seat mate. Sometimes we’ll chat but more often we don’t. The bus departs and the driver goes into his usual spiel about the features of the bus. He reminds everyone that they are required by law to wear their seatbelts. Hardly anyone does. As we make our way through the early evening traffic we make a couple of stops to pick up more passengers. It’s too dark to see the view as we go over the Bridgewater Bridge but the successive bumps in the road tell me when we’ve reached it. Once we get on to the new Brighton bypass I tend to lose my sense of direction in the dark. There is not much to see and in the dimmed lighting most passengers doze including me. I wake up with a start, it’s dark and I have to get my bearings. Usually we are still twenty minutes or more from Oatlands. I can feel that the bus is climbing and decide that we are probably somewhere around Constitution Hill one of the steeper parts of the Midland Highway. Finally the bus turns off the highway and takes the road into Oatlands. I try to see into the window of the supermarket as we go down the High Street as I know my sister is in there working. Occasionally I catch a glimpse of her. The bus stops outside the pub and I say goodbye to the driver before walking the few metres to her house. On Monday morning I will be heading home on a bus full of sleepy people from Devonport and Launceston and will be able to enjoy the journey in daylight. Having read the offending article I could not agree more. It’s official. The mainstream media has gone stark raving mad. Author Taswegian1957Posted on 22/06/2013 07/03/2014 Categories Rants, RebloggedTags media, Opinion, political, rantLeave a comment on It is official.